...but the music (and most of the musical is sung-through) is, like, largely hip-hop. There are rap duels between Hamilton and Thomas Jefferson (who was costumed in a fabulous velvet purple 18th century waistcoat and breeches), there's R&B, there's a hilarious recurring ditty sung by Andrew Rannells called "You'll Be Back." Andrew Rannells plays George III. You know, the king the American colonies wanted to dump. It's probably un-American of me to enjoy George III that much. But he was so archly funny ("They say George Washington's yielding his power and stepping away. 'Zat true? I wasn't aware that was something a person could do.") And I want a scepter to wave around in my everyday life now. Another favorite: Jefferson taunting Hamilton after the Reynolds pamphlet: "Well, he's never gon' be President now." Lin-Manuel Miranda as Alexander Hamilton. From the New York Times. Also, the vast vast majority of the parts are played by black and Hispanic actors. That's right, a bunch of dead old rich white men played by a very diverse cast--and other than the usual parsing of figuring out who's who, it's not even anything to think about. See, Hollywood? You can cast actors of color! You can cast them in parts that white people would play! You can have them play the roles of the people who founded our country. The time period in the musical is suggested through the costumes. 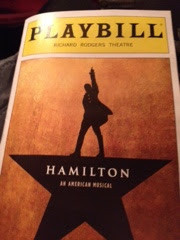 Of course, there's a historical element to all of it which I loved--and realized how little I actually know about Alexander Hamilton and the very earliest years of the United States. 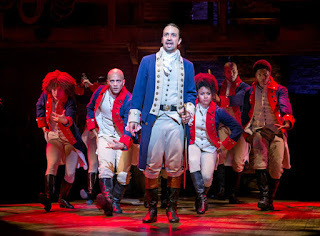 But with the music, the cast, and frankly, the repeated reminder that Hamilton was an immigrant and the foreboding mentions of dueling (guns), Hamilton is also a story that is very much about the now in America, too. 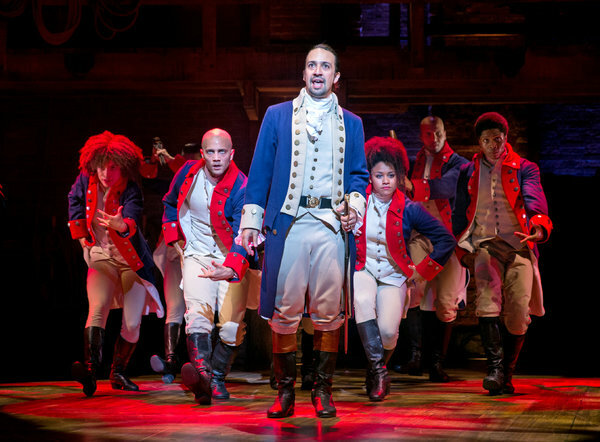 I'm like 99.99% sure that Hamilton will win next year's Tony for Best Musical. I can't wait. I know very little about American History - but I know he did something important. He is on the $20 bill, right? It's pretty hilarious that the cast was so diverse. I looked at that picture and thought, "Now that's interesting." He's on the $10 bill. He basically set up America's financial systems, particularly Wall Street. That's not something I've ever been interested in, so I didn't know much about him. Ooooooh, I'm jealous! That's awesome that you were able to see the show! I know!! We felt like the cool kids for once! None of us can stop listening to the music now. Raps! Sounds like something I want to see:) could have gone horribly wrong but good thing it didn't! And yes! People of color taking on roles :) You seen the trailer for the new Peter Pan movie? The actress who plays Tiger Lily looks the farthest from Native American >___> ridiculous. Have you heard of the musical In The Heights? Lin-Manuel Miranda wore that, too. Hamilton's #1 on the rap charts this week. Haven't seen the new Peter Pan trailer. Really? That's disappointing!